We were recently challenged by a customer to provide an economical cordless handset solution for their Skype for Business deployment. This same solution was required at each of their many small sites, so the economies of scale of a larger certified WiFi solution couldn’t be realised. There was no requirement for roaming as each of the sites is essentially autonomous, and this started us looking to stand-alone DECT solutions. 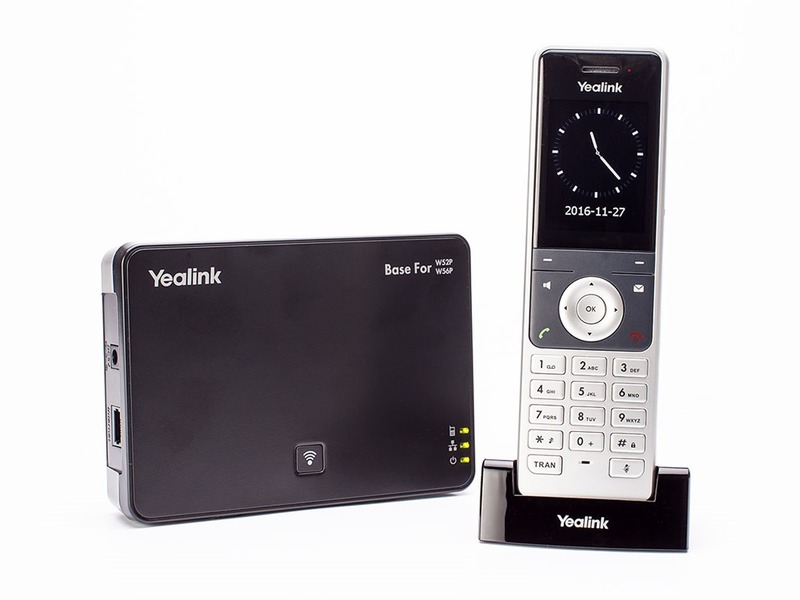 For the endpoint devices we chose the Yealink SIP DECT “W56P” base-station and DECT handset package. This pairing currently has a retail price of just over AUD200, so it ticked that box for the customer as well. You can register up to 5 handsets to the one base, so if you want to expand on the above the purchase of the “W56H” SKU (~AUD150) includes just the phone components of handset, battery, charging cradle, belt clip & USB power adapter. The DECT radio (base-station) can be powered by PoE so out in the real world you can locate these where-ever you can string a network cable. I fed mine in the greiginsydney lab via PoE, but of course if you don’t have that luxury (as in our customer’s smaller sites) the included plugpack is the way to go. 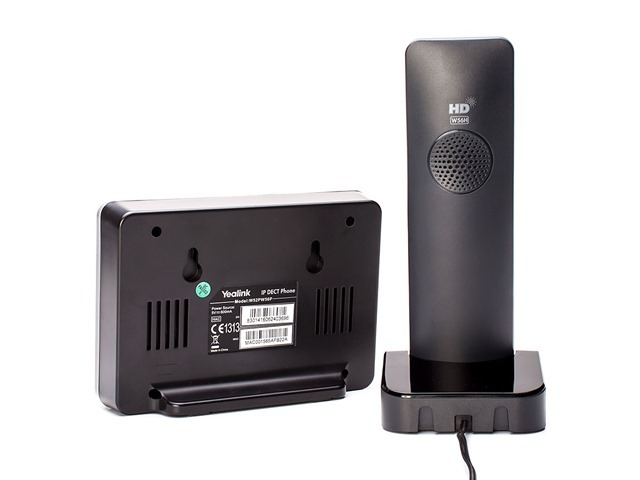 Both the DECT radio and charging base have rear-mounted keyhole slots for wall-mounting. The ‘foot’ out the back of the base (visible in the RH photo) will prevent the base sitting flat to the wall if you use the keyholes. Hopefully that won’t upset too many aesthetes – I presume it was a deliberate decision to ensure the ventilation slots have more chance of catching some passing airflow. When flat on a desk and also when wall-mounted the handset sits in the charging base at a nice angle reclining away from you, reducing the risk of it falling out, even if hurriedly returned to the base. There’s a rim at the front that helps this too, as well as two circular locating studs that also contain the charging conductors. The cradle is essentially rectangular in shape (with some rounding of edges) so will make for an efficient layout if you wall-mount multiple units alongside each other. Although not (yet?) available with SfB firmware, Yealink has been rapidly expanding their SfB product portfolio since becoming a certified handset vendor, and we have hopes that perhaps in the future we’ll see this family able to interface directly to SfB. For the time being however we’re registering these to the customer’s Sonus SBC 1000 gateway and hopping to SfB from there. More of that in another post coming soon. 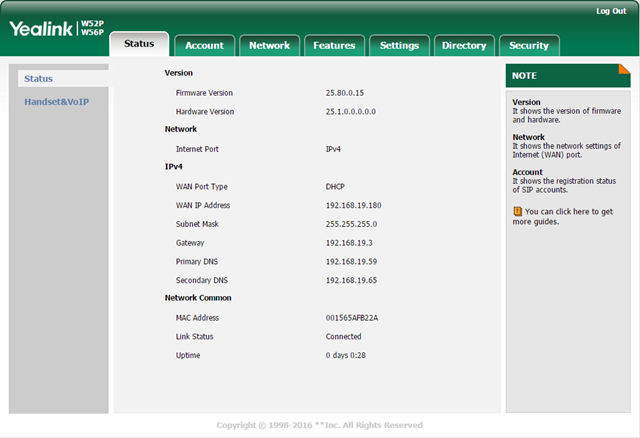 (BTW you’re able to customise the hostname it provides to DHCP from the default “W52P” on the General Information screen under Features). Pairing the handsets with the base is a simple process and does not require PC access, which is great for staging before you ship the units to site. If you happen to be within range of the base you commence this by pressing and holding the button on the base for around 5 seconds – until the pairing LED (the top one on the right-hand edge) flashes slowly. Now from the handset it’s a matter of pressing the central ‘OK’ button to bring up the menu, then Settings / 6.Registration / Register Handset / <select the base from the list on-screen> / OK / <Pin:0000> / Done. In operation I found it a really nice handset to use. The buttons are large and give great tactile feedback, with the screen responding promptly to key-presses. I couldn’t fault the audio quality (testing as I was using G.711a). Range is a hard one to test, but I went for a wander out in the street here in suburban Sydney outside the double-brick Greiginsydney fortress and made it almost 50m (164’) before the audio started to go a bit choppy. It’s performance within the building was flawless. The review unit was supplied by Yealink Australia, and as always the photos are by my in-house photographer and partner Rocky. 27th August 2017. This is the initial release. sounds interersting, if they offer a Skype for Business/SFBo Aware Firmware for that base unit. But Keep in mind. It is still a “single Location base” and you cannot cover a building with multiple base stations. Thats still the market für Ascom, Spectralink and others with a “Controller” and decentralized DECT antennas. As always, thanks for the info! This does look like a very simple and not too expensive DECT solution.